AidData's Pat Austria (College of William and Mary Class of '13) speaks at the U.S. Global Development Lab Launch April 3, 2014. Photo by David Trichler for AidData, all rights reserved. The challenge that adviser articulated was not unique to Haiti. Flying blind is not an effective way to do business, yet “data poverty” remained widespread for many countries in Africa, Asia, and Latin America, hamstringing development efforts. Recognizing the problem, an increasing number of aid agencies had highlighted the need for more granular aid data, but conventional wisdom held that it would be impossible to collect precise local data for development at any kind of scale. When AidData entered into a five-year, $25-million cooperative agreement with USAID in 2012, we had already developed proof-of-concept for large-scale geocoding (the tagging of development project information at the local or regional level) through successful pilots with the World Bank and the Government of Malawi. 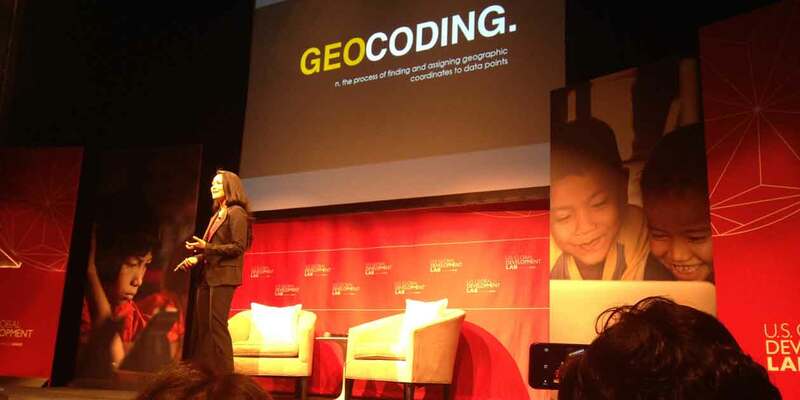 USAID’s big bet on geospatial data enabled us to bring this effort to a truly global scale: in five years of partnership, AidData geocoded over 130,000 development activities representing more than $750 billion of development assistance. Our ability to sustain and accelerate this global growth was dependent on building a large distribution network of partners: no matter how good the idea, AidData would never be big enough, on our own, to bring it to the scale we needed. We therefore established over 100 partnerships to produce and use geocoded data — more than 30 of these with USAID Missions and Operating Units. This screenshot of a visualization from Nepal’s Aid Management Platform, powered by Esri, shows where health structures and USAID projects are located in-country. Image by AidData, all rights reserved. USAID’s leadership in investing in geospatial data also catalyzed a broader global movement of support and investment from other top bilateral and multilateral donors. In partnership with AidData, the African Development Bank and the Asian Development Bank invested heavily in geospatial data infrastructure — not only geocoding their own data, but also changing their internal systems and processes to integrate the use geospatial data throughout the entire project life cycle. KfW, the German Development Bank, is working to mainstream geospatial impact evaluation into the day-to-day work of their Evaluation Department. And in 2015, the Office of the President at the World Bank Group officially adopted AidData’s geocoding methodology, and systematically applied subnational geocodes to the Bank’s IDA, IBRD, IFC, and MIGA investments. These four World Bank Group institutions collectively invested $61 billion in 2016. Representatives from countries with Aid Management Platforms and interested countries convene at the 2013 AMP Good Practices Workshop in Addis Ababa, Ethiopia to discuss uses of the platform and best practices for the future. Photo by AidData, all rights reserved. With USAID’s investment, AidData built on the success of our first multi-donor geocoding pilot in Malawi to partner with 11 country governments, and geocode all known development projects in their existing Aid Information Management Systems (AIMS). Many of these countries are also members of the Aid Management Program (AMP), a network of more than 25 countries shepherded by AidData partner Development Gateway. The AMP network has become a powerful distribution channel for sharing best practices and lessons learned to implement geocoding across borders and oceans, most often through exchange trips and the annual “AMP Good Practices Workshop” attended by more than a dozen countries. At the 2014 workshop, the Ministry of Finance in Nepal (AidData’s first geocoding partner country under the USAID award) showcased the geospatial data and tools newly and publicly available on their online Aid Management Platform. The presentation sparked interest from workshop participants, who remarked how helpful it would be if their own systems could include the data and tools featured. Several countries (including Kosovo, Kyrgyzstan, Moldova, and Madagascar) have since implemented the AMP GIS tool to better visualize and analyze their geospatial data. Over the last five years, AidData has developed new geospatial methods and technologies, while building a distribution network of partners that enables these innovations to reach across the globe. Our Higher Education Solutions Network partners have been crucial ambassadors in scaling geocoding to other AMP network members beyond our original 11 partner countries, including to Cote d’Ivoire and Chad. Editor’s Note: This post is the fifth and final in a series taking a look back at some of the lessons learned and accomplishments of the AidData Center for Development Policy (ACDP) over the past five years funded by the U.S. 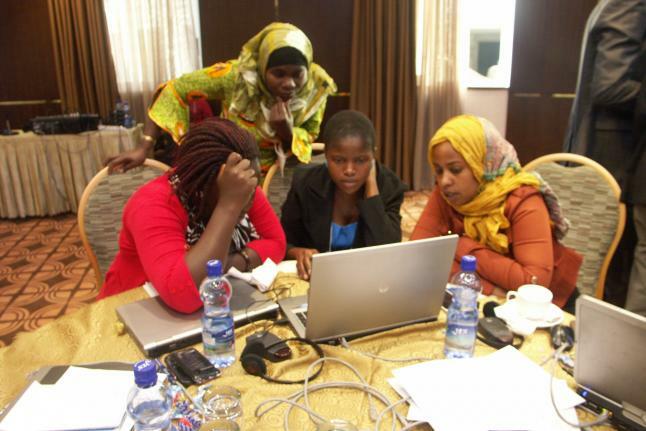 Global Development Lab under USAID's Higher Education Solutions Network Program. The ACDP is a partnership between AidData at the College of William & Mary, Development Gateway, the University of Texas-Austin, Brigham Young University, and Esri. USAID has granted a no-cost extension through September 30, 2022 to enable continued collaboration between the AidData Center for Development Policy and USAID units. 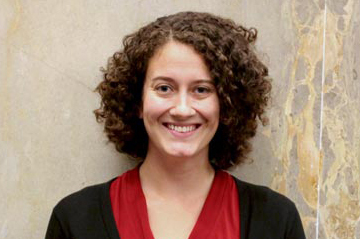 Alena Stern managed AidData's USAID Higher Educations Solution Network (HESN) award from 2013-2017.